At $399 and up, Apple's refreshed iPad mini, which looks an awful lot like the 2015 generation, is obviously no match for the 2018-released iPad Pro lineup, which starts at a $799 price, in terms of raw power, sleek design, or modern features. But believe it or not, the smallest new member of the world's best-selling tablet family might actually hold an important advantage over its 11 and 12.9-inch cousins... in addition to superior portability. While the iPad mini (2019) is not significantly thicker than the latest iPad Pro variants, at 6.1 versus 5.9mm, its compact size and minimalistic design appear to contribute to vastly better durability. That's at least according to popular YouTuber and master gadget destroyer Zack Nelson from JerryRigEverything, who managed to bend the iPad Pro 11 (2018) out of shape and pretty much break the thing in two with little to no effort last fall. As you can see in the recently uploaded video embedded above (at around the 6-minute mark), it takes a bit more muscle to flex Apple's newest 7.9-incher, which also miraculously survives this grueling test with its functionality intact. Once bent, the iPad mini 5 cannot be (completely) unbent, but the slate essentially defies physics, locking out at an obtuse angle no matter how hard you might try to further compromise its integrity. Clearly, that's not an ideal durability behavior, but the $399 build quality is substantially better than what you're getting in exchange for $799 and up. Of course, no (sane) iPad mini 5 owner is likely to replicate Nelson's treatment of the hot new tablet out in the real world, but this experiment is usually a good indicator of how well gadgets can handle long-term usage and day-to-day abuse. 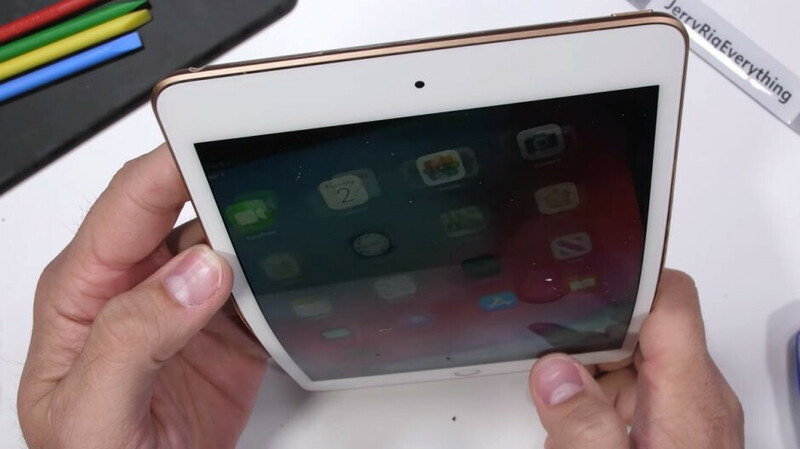 Something tells us the refreshed iPad mini will not ship with any sort of a bend out the box, with scratch tests pretty much yielding the expected results in this day and age. The screen is covered in tempered glass, the front and rear-facing cameras are similarly protected against keys and coins, and the metal sides are as robust as always. All in all, this is definitely a well-constructed device justifying its price. Cheap products at premium prices, gotta love Apple, I admire them but it's not their fault, the customers are the light minded ones, apple name for many of them is a status quo. Poor people pretending to be rich just to feel better. If you want a tablet, iPads are the only ones with a good, optimized library of apps and long support. There are not really any good android competitors around. The iPads are actually good deals and are praised, just like iPhones and MacBooks for their class-leading build quality. Their products are expensive, but certainly not cheap to make and saying people are buying them just for their logo is bulls**t. Many people just like the way Apple products work, their ecosystem and support. iPads are the most sensibly priced apple products. Not the pros. The iPad, mini and air are devices you can keep for years. Top notch performance. You should be writing press releases for Apple. Many people buy them just for their logo and their build quality is not as great as you make out. Apple's quality is is no longer class leading and the bs with their fake camera lens "sapphire" glass is constantly mentioned by Jerryrigeverything. If people like the ecosystem that's ok. Personally I will never get trapped in those golden handcuffs. There are plenty of decent Android options from Samsung, Huawei etc with ALL apps optimized for both mobile and tablets unlike the Apple app store. False. If you all you care about is mobile apps, then iOS has zero advantage over Android for the most downloaded apps, unless they are exclusive to one platform. I can do everything on my phone i need. I don't need a tablet. a Windows tablet like the Surface can do most of the apps iPad have, because those apps are replaced using the web browser. The iPad is not a needed device, it is a convenience. where you can mimic many PC functions, on something that is more portable. For get about desktop apps for a minute and just consider everyday useful apps we use. What does the iPad do that's so exceptional that no other device does? NOTHING. They should get credit for foldable phones. Here is the thing. A thin, big slap of metal will bend, whether it is an iPad or Samsung Tab S5e. If they made it like 11 mm thick, they may have been able to not make it bend. Since iPads are not carried around in pockets, I do not see the issue here though, since the likelihood of accidentally bending one is minimal. Wonder how the new Samsung Tab S5e at only 5.5mm thin with do? The fact that it bends like that, just shoes its a piece of carp.Older iPads did not bend this easily. Even plastic tablets back from the old days, can handle bending with the hands. This is worse than how cars are built now, using cheap aluminum sheet-metal. But cars have a cage that actually protects you when the rest of the car collapses around you. The Surface Pro holds up far and away better than the iPad at similar prices points -https://www.youtube.com/watch?v=iBHUIR7PtWk Apple stated once, they couldn't make a smaller tablet that wasn't a piece of crap. well they proved it. I have a mini and after seeing vids of how easy they bend, I try to be very careful with it. Even though I bought it 2nd hand for $250. Since OEM's are using cheap materials like aluminum and glass, they need to frame the edges with more material. It doesn't even take much. In fact if they added just 3MM of material inside the edges, the tablet would not bend with the bare hands.